Media Mikes is excited to be working with Feld Entertainment again to bring our readers a wonderful opportunity to win a family 4-pack of tickets to the upcoming Disney on Ice presents Mickey’s Search Party at the Amway Center in Orlando, FL. If you want to win this great prize, please leave a comment below or email us with what Disney character would you love to see make an appearance at a Disney on Ice show!This giveaway will remain open until August 24th at Noon, Eastern Time. This is open to our readers in Orlando, FL only, no travel included. One entry per person, per household. All other entries will be considered invalid. Media Mikes will randomly select winners. Winners will be alerted via email. Disney On Ice presents Mickey’s Search Party brings the magic closer to fans than ever before through dynamic and immersive moments that take place on the ice, in the air and in the seats when the show comes to Amway Center in Orlando September 7-9, 2018 for six performances. Produced by Feld Entertainment Inc., the worldwide leader in live touring family entertainment, Disney On Ice is once again elevating the ice show experience with brand-new engaging elements that will fascinate both newcomers and seasoned guests, alike. Tickets are on sale now at DisneyOnIce.com. Joined by Mickey Mouse and Minnie Mouse, live hosts will enliven the performance space by welcoming everyone into the magical world of Disney On Ice, setting the stage for a participatory adventure. Guests will embark on a search for clues to find Tinker Bell after Captain Hook tries to capture her magic. As each scene unfolds, compelling storytelling will be delivered through multi-level production numbers by skaters, performers and acrobats, alike. As Miguel from Disney●Pixar’s Coco crosses the Marigold Bridge, he finds himself in the magnificent spirit realm painted with vibrant color, with skeletons atop sway poles oscillating back and forth over the audience in this culturally rich, heritage celebration. Through video projection, Arendelle builds from the ground up, and ice harvesters from Disney’s Frozen use extreme skating to launch themselves from the mountainous, wintry slopes delivering an athletically-driven performance as they chop their way through blocks of ice. The iconic chandelier seen in “Be Our Guest” comes to life as Belle and the enchanted objects from Beauty and the Beast become a rotating carousel using aerial silks and lift upward into the air, mesmerizing onlookers seated above and below. Media Mikes is excited to be provided a special discount for our readers: Save 20% off select seats with code SAVE20. Not valid on premium VIP seating. Hurry for the best available seats! Code expires September 6, 2018. Mickey’s Search Party will feature a collection of Disney characters fans know and love portrayed by decorated performer-athletes who push the boundaries of what is possible. Their theatrical talent, combined with this innovative Disney On Ice production, elevates the live entertainment experience and will leave families with memories that will last a lifetime. Ticket Prices: Starting from $18. For ticket information, visit DisneyOnIce.com. Orlando Show Times: Friday, September 7, 7:30 p.m.; Saturday, September 8, 11 a.m., 3 p.m. and 7 p.m.; Sunday, September 9, 1 p.m. and 5 p.m.
Warner Bros.’ Classic Holiday Film “A Christmas Story” will be Featured in Frozen Spectacular Ice! During Christmas at Gaylord Palms! ICE! and the resort’s mix of holiday entertainment runs November 16 through January 6. KISSIMMEE, Fla. – (July 17, 2018) – For the first time ever, beloved holiday film “A Christmas Story” will be recreated as a frozen, immersive attraction inside ICE!–the signature experience during Christmas at Gaylord Palms. During the holiday season, the Orlando-area resort welcomes guests to make memories amongst festive décor and a charming mix of Christmassy activities and shows, becoming “Everything Christmas in One Extraordinary Place” for the 52-day event, Christmas at Gaylord Palms presented by Pepsi. CINEMATIC HOLIDAY CLASSIC IN ICE! “A Christmas Story” has been a staple of holiday movie lists for years, but now guests can experience this holiday favorite in a whole new way inside ICE! presented by DEI. The hilarious family tale will come to life through hand-carved ice sculptures and displays, inviting guests to relive the film’s iconic scenes such as The Old Man’s Major Award, Aunt Clara’s pink nightmare and the ultimate triple dog dare at the school’s flagpole, and many more! The ICE! attraction is crafted by artisans from Harbin, China, home of the world’s largest ice and snow sculpture festival, who travel more than 6,000 miles to hand-carve more than two million pounds of colorful ice, creating larger-than-life sculptures. This year, as guests explore the nine-degree attraction, they will discover more than a dozen fan-favorite scenes from “A Christmas Story,” along with the event’s two-story ice slides and the popular Frostbite Factory live ice carving showcase. The ICE! experience concludes with a separate area dedicated to a traditional Nativity created with crystal clear ice. Award-winning buffet restaurant Villa de Flora will welcome special Christmastime friends during The Elf on the Shelf® Character Breakfast, where guests can join Santa’sOfficial Scout Elves for a fun and festive character breakfast. Kids and adults will enjoy a delicious buffet spread complete with classic breakfast favorites and live cooking stations, enjoying special visits from Santa’s Official Scout Elves as they dine. Gaylord Palms’ St. Augustine atrium will be home to a brand-new, dazzling light show when Dreams of Christmas makes its debut. This multisensory experience will feature a new musical score accompanied with millions of dancing, choreographed lights all around the resort’s six-story Christmas tree during nightly shows. “Holiday thrills” take on a whole new meaning during Cirque Dreams Unwrapped, a 25-minute, action-packed experience, featuring soaring acrobatics, theatricality and imagination that will have guests on the edge of their seats. Cirque Dreams Unwrapped features new acts and performers each year to bring to life a magical and timeless Christmas wonderland, all imagined by Broadway director and renowned Cirque Dreams founder Neil Goldberg. Guests exploring the meandering paths inside the resort’s Everglades atrium will find the Christmas Tree Trail, a display of nine magnificent trees provided by Balsam Hill. Sparkle the Elf, Santa’s chief Christmas Tree Decorator, has personally prepared these for display at Gaylord Palms. From snowmen and candy canes to reindeer and nutcrackers, each tree represents one of Sparkle’s favorite things about Christmas, with one even honoring the Florida-themed resort! The immersive, interactive Reindeer Express Post Office returns this year, where everyone is invited to jot down their top Christmas wishes on a postcard before entering this special facility to launch their wishes off on a journey to Santa. Festive Alpine Village will again be the central hub for holiday happenings. In addition to ICE!, the village is home to various attractions and shows, Photos with Santa, seasonal food and beverage options plus holiday retail locations, including a Build-A-Bear Workshop®, where imaginations soar. Guests choose from all kinds of furry friends to make and bring home, including the Gaylord Hotels-exclusive light-up Snowburst polar bear. Gingerbread Decorating Corner returns, now located inside the brand-new Alpine Village Sweet Shop! Guests may select a gingerbread house or a themed cookie kit to enjoy a sticky and fun interactive experience, creating sweet souvenirs to take home. The Alpine Village Sweet Shop will offer additional candies and treats for purchase to decorate sugary masterpieces or to delight someone’s sweet tooth. The deliciously fun gingerbread pair, Cinnamon and Nutmeg, will also be available for toasty hugs and holiday photos. Mrs. Claus’ Christmas Traditions brings the First Lady of the North Pole back to Gaylord Palms as she leads a half-hour interactive show. Guests enjoy classic holiday stories and a sing-a-long, plus a delicious finale as the holiday hostess presents everyone with warm cookies and a glass of cold milk. Santa’s Snow Throw puts real snow in the hands of guests as they show off their pitching prowess by tossing snowballs at a variety of interactive targets created by Santa’s Elves. Bragging rights go to those with the best aim! Snow Tubing sends guests zooming down an eight-lane tubing hill covered in real snow. This all-ages attraction offers both single and double tubes to accommodate children and parents. The best way to experience all of Christmas at Gaylord Palms is with an overnight stay. One-night packages start at $250 plus tax, resort fee and parking. Packages include ICE! tickets for two (with option to add additional adults or children) plus a souvenir family photo. Overnight guests may also schedule a visit to ICE! during the daily hotel guest-exclusive Extra Cool Hour from 9 a.m. to 10 a.m. Make the holidays merrier and extend the package to stay for multiple nights! For additional information and to book packages or tickets, visit www.GaylordHotels.com . Gaylord Palms Resort offers Christmastime field trips for schools, youth organizations and religious groups, customizable with educational or performance opportunities. Special ICE! ticket rates also are available to groups of ten adults or more. For companies wishing to offer their staff an unforgettable holiday outing, Gaylord Palms offers the ideal “Everything Christmas” setting for onsite catered events with 10 to 3,000 guests, with or without an ICE! experience. To learn more about planning a holiday event, contact www.GaylordHotels.com. Christmas at Gaylord Palms is open daily from November 16, 2018 through January 6, 2019 including holidays. Gaylord Palms Resort offers a mix of entertainment year-round, creating a superior guest experience in one of the world’s most popular tourist destinations. Guests are welcomed into the resort’s 4.5-acre soaring glass atrium featuring winding waterways, lush gardens and animal habitats. Our extraordinary amenities include fine and casual dining, spa and shopping – all conveniently located within minutes of the Orlando area’s theme parks. Learn more about the resort at GaylordPalms.com and stay connected with all the resort happenings by following @GaylordPalms on Facebook, Twitter and Instagram. include Gaylord Opryland in Nashville, Tennessee; Gaylord Palms in Kissimmee, Florida; Gaylord Texan on Lake Grapevine, Texas; Gaylord National on the Potomac in National Harbor, Maryland; Gaylord Rockies in Aurora, CO, opening late 2018; and The Inn at Opryland in Nashville. For more information, visit www.GaylordHotels.com. PEPSI is a registered trademark of PepsiCo, Inc. The Elf on the Shelf® and ©2018 CCA and B, LLC. All Rights Reserved. Orlando, Fla. – June 26, 2018 – Disney On Ice presents Mickey’s Search Party brings the magic closer to fans than ever before through dynamic and immersive moments that take place on the ice, in the air and in the seats when the show comes to Amway Center in Orlando September 7-9, 2018 for six performances. Produced by Feld Entertainment Inc., the worldwide leader in live touring family entertainment, Disney On Ice is once again elevating the ice show experience with brand-new engaging elements that will fascinate both newcomers and seasoned guests, alike. Tickets are on sale now at DisneyOnIce.com. Joined by Mickey Mouse and Minnie Mouse, live hosts will enliven the performance space by welcoming everyone into the magical world of Disney On Ice, setting the stage for a participatory adventure. Guests will embark on a search for clues to find Tinker Bell after Captain Hook tries to capture her magic. As each scene unfolds, compelling storytelling will be delivered through multi-level production numbers by skaters, performers and acrobats, alike. As Miguel from Disney●Pixar’s Coco crosses the Marigold Bridge, he finds himself in the magnificent spirit realm painted with vibrant color, with skeletons atop sway poles oscillating back and forth over the audience in this culturally rich, heritage celebration. Through video projection, Arendelle builds from the ground up, and ice harvesters from Disney’s Frozen use extreme skating to launch themselves from the mountainous, wintry slopes delivering an athletically-driven performance as they chop their way through blocks of ice. The iconic chandelier seen in “Be Our Guest” comes to life as Belle and the enchanted objects from Beauty and the Beast become a rotating carousel using aerial silks and lift upward into the air, mesmerizing onlookers seated above and below. In a high-energy opening number, Club Mickey Mouse-inspired performers will hype up the crowd through cutting-edge figure skating choreography and hoverboard tricks on the ice. Air tracks will also allow the hilarious pirates aboard the Jolly Roger to flip, tumble and twist to greater heights as they attempt to showcase their talents for Captain Hook. Aerial straps combined with adagio pair skating will elevate Ariel’s transformation from mermaid to human creating a spell-bounding sequence high above the ice with Prince Eric to the classic song, “Kiss The Girl.” Creative costume design and fabrication will enhance the scenes as the ensemble imitate life “Under the Sea” from Disney’s The Little Mermaid, and will also give the illusion the ice is enveloped in flames as Moana encounters Te Ka on her daring voyage to restore the heart of Te Fiti. Featuring the Box Office Smash Hits Disney’s Moana and Beauty and the Beast! ORLANDO, FL — Make unforgettable memories with Mickey, Minnie and all your Disney friends when Disney On Ice presents Dare To Dream comes to Amway Center in Orlando May 11-13, 2018! 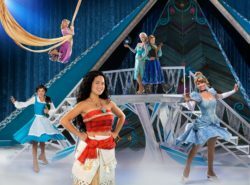 The ice skating extravaganza features Disney’s Moana for the first time in a live production. Good seats are still available for Disney On Ice presents Dare To Dream, which was originally scheduled for September 8-10, 2017, but postponed due to Hurricane Irma. Tickets purchased for the September dates will be honored in May for the exact same day of the week and show time. Celebrate what’s possible as five Disney heroines spark the courage inside us all at Disney On Ice presents Dare To Dream! In her Disney On Ice debut, see how far Moana will go in an action-packed adventure with demigod, Maui, to save her island and discover her true identity. Join Belle as she fearlessly befriends the enchanted castle staff and reveals the Beast’s gentleness. Experience Anna’s devotion to her sister, Elsa, on her life-changing journey to stop an eternal winter. Explore with Rapunzel, Flynn Ryder, Cinderella and friends from around the Disney Kingdom as they find the strength, heart, and determination to make their dreams come true. Hosted by Mickey and Minnie, uncover why no dream is too big when we find the strength to shape our own destiny at Disney On Ice presents Dare To Dream! Good seats are still available! Since you are fans of Media Mikes, we are happy to share a special discount: Save 20% off select seats with code SAVE20. Not valid on premium VIP seating. Hurry for the best available seats! Code expires May 10, 2018. Discover your inner hero when Disney On Ice presents Dare To Dream comes to your hometown! Ticket Prices: Starting from $18. Market pricing applies to all tickets. Rates can fluctuate based on factors that affect supply and demand. Lock in your price and location today! Show Times: Friday, May 11, 7:30 p.m.; Saturday, May 12, 11:00 a.m., 3:00 p.m. and 7:00 p.m.; Sunday, May 13, 1:00 p.m. and 5:00 p.m.
For ticket information, go to DisneyOnIce.com. To celebrate the arrival of Disney On Ice Presents “Dare to Dream” coming to the Amway Center in Orlando from September 8-10, 2016, Media Mikes would like to give our fans a chance to win a family four pack of tickets to this monumental ice skating spectacular. Please leave us a comment below or send us an email with your favorite Disney on Ice memory from when you were younger or with your family. This giveaway will remain open until August 30th. This is open to our readers in Florida only unless you want to travel. One entry per person, per household. All other entries will be considered invalid. Media Mikes will randomly select winners. Winners will be alerted via email. Saturday, Sept. 9 at 11am. Save 20% off select seats with code SAVE20. Not valid on premium VIP seating. Hurry for the best available seats! Code expires September 7, 2017. Disney’s Moana voyages onto the ice for the first time as Disney On Ice presents Dare To Dream, produced by Feld Entertainment Inc., brings courage and adventure to hometowns across North America. Hosts Mickey Mouse and Minnie Mouse bring audiences on an expedition across raging seas and snow covered mountains in this action-packed extravaganza featuring Disney’s Beauty and the Beast, Frozen, Tangled and Cinderella with other beloved Disney characters to help tell these extraordinary tales. Tickets are on sale today for the 2017 tour dates. Feld Entertainment is the worldwide leader in producing and presenting live touring family entertainment experiences that uplift the human spirit and bring people together. With millions of people in attendance at its shows each year. Feld Entertainment’s productions have appeared in more than 75 countries and on six continents to date and include Monster Jam®, Monster Energy Supercross, AMSOIL Arenacross, Disney On Ice, Disney Live! and Marvel Universe LIVE! More information about Feld Entertainment is available online at www.feldentertainment.com. Christmas at Gaylord Palms wins the holidays with ICE! featuring “A Charlie Brown Christmas”! Every Christmas season one of the staple events that we must attend is always Christmas at Gaylord Palms in Kissimmee, FL. This has been one of my favorite attractions during the holidays since I moved to Florida back in 2010. This year ICE! is featuring “A Charlie Brown Christmas” presented by Pepsi. Let me just say that I have been coming to ICE! for years now and THIS IS THE BEST YEAR EVER! Wow, I cannot say enough good things about this Christmas at Gaylord Palms in general this year. All I can say is that everyone NEEDS to take a trip this year and not to miss this wonderful attraction. If you have never heard of ICE! Well, then you are missing out. The story of “A Charlie Brown Christmas” is showcase through several rooms of interactive ice sculptures and displays. Get ready for this…there are two million pounds of ice that were hand-carved to create these iconic scenes with the Peanuts gang. And I saved the best part for last this all takes place inside a frosty 9-degree environment! That’s right 9-degrees, so make sure to dress VERY warm cause it is a bit chilly to say the least! Christmas at Gaylord Palms doesn’t just consist of ICE! though. They also have an amazing light show called “A Christmas Wish”, which is an amazing all-new six-minute light show. It features narration, classic holiday music and dazzling visual effects topped with an outstanding 60-foot LED-lit Christmas tree in the center of above Emerald Plaza. This is free to everyone visiting the resort, so it is must see for sure. Also in the Emerald Plaza there is a stage show “Cirque Dreams Unwrapped”, which is a breathtaking performance with some amazingly talented performers. My daughters mouth was literally to the ground in awe this entire performance. Also not to be missed! Some new offerings include Mrs. Claus’ Christmas Traditions and Santa’s Snow Throw. I have to just say that Mrs. Claus’ Christmas Traditions was probably a highlight of the whole Christmas at Gaylord Palms. It is a half-hour interactive show where guests can get to spend some time with Mrs Claus as she reads “Twas the Night Before Christmas” along with a very funny silly Elf at her side. If that isn’t enough you are also treated with fresh warm chocolate chip cookies and a some cold milk. I didn’t get a chance to try out Santa’s Snow Throw but it also looked like a lot of fun. You can toss real snowballs at a variety of targets in this carnival-style game. One of my daughters favorite attractions is getting to visit the Build-A-Bear Workshop. This year we had the pleasure to make a Poppy bear from the new movie “Trolls”. Alpine Rush Snow Tubing has always been a favorite as well. They changed the queuing process a little this year that made it a little harder to ride over and over due to queue backing up but we still took at least 5 trips up and down this year. To top off the night, my daughter was able to meet the Peanuts gang as well in person as Charlie Brown, Lucy and Snoopy were there to meet the guests and take pictures! So like I said this year is the year to spend the holidays at Christmas at Gaylord Palms. I have no idea how they are planning on topping this for next year but I honestly cannot wait to find out what they have planned! Merry Christmas and enjoy the holidays this year…and don’t forget to make a trip to Gaylord Palms! To celebrate the arrival of Disney On Ice Presents “Follow Your Heart” coming to the Amway Center in Orlando from September 2-4, 2016, Media Mikes would like to give our fans a chance to win a family four pack of tickets to this monumental ice skating spectacular. Please leave us a comment below or send us an email with your favorite Disney character from this upcoming show!. This giveaway will remain open until August 21st at Noon, Eastern Time. This is open to our readers in Florida only unless you want to travel. One entry per person, per household. All other entries will be considered invalid. Media Mikes will randomly select winners. Winners will be alerted via email. Friday, September 2 at 7:30 p.m.
Just keep swimming with Dory, Nemo, Marlin and new pal Hank from Disney•Pixar’s Finding Dory as they embark on a life-changing excursion to find her parents and discover the true meaning of family. Cheer with the Emotions from Disney•Pixar’s Inside Out –Joy, Sadness, Anger, Fear and Disgust– as they help Riley find the confidence to win the hockey championship and experience the emotional rollercoaster of growing up. Venture to wintery world of Arendelle where Olaf and Kristoff help reunite royal sisters Anna and Elsa from Disney’s Frozen and learn love is the most powerful magic of all. See Cinderella, Rapunzel, Tiana and the Disney Princesses make their dreams come true through their virtues of bravery, kindness and perseverance. And celebrate true friendship with Buzz Lightyear, Woody and The Toy Story gang. Make unforgettable memories with Mickey, Minnie and all your Disney friends when Disney On Ice presents Follow Your Heart skates into your hometown! ORLANDO, FL – July 7, 2016 — Disney On Ice presents Follow Your Heart is bringing Disney•Pixar’s record-breaking animated feature Finding Dory to the ice for the first time in this live production produced by Feld Entertainment. The ice skating extravaganza featuring Disney•Pixar’s Inside Out, Disney’s Frozen and other beloved Disney stories visits Orlando from September 2-4, 2016 for six performances at Amway Center. Just keep swimming with Dory, Nemo, Marlin and new pal Hank from Disney•Pixar’s Finding Dory as theyembark on a life-changing excursion to find her parents and discover the true meaning of family. Cheer with the Emotions from Disney•Pixar’s Inside Out –Joy, Sadness, Anger, Fear and Disgust– as they help Riley find the confidence to win the hockey championship and experience the emotional rollercoaster of growing up. Venture to wintery world of Arendelle where Olaf and Kristoff help reunite royal sisters Anna and Elsa from Disney’s Frozen and learn love is the most powerful magic of all. See Cinderella, Rapunzel, Tiana and the Disney Princesses make their dreams come true through their virtues of bravery, kindness and perseverance. And celebrate true friendship with Buzz Lightyear, Woody and The Toy Story gang. Make unforgettable memories with Mickey, Minnie and all your Disney friends when Disney On Ice presents Follow Your Heart skates into your hometown! Tickets for Disney On Ice presents Follow Your Heart start from $18. Market pricing applies to all tickets. Rates can fluctuate based on factors that affect supply and demand. Lock in your price and location today! Show Times: Friday, September 2, 7:30 p.m.; Saturday, September 3, 11:00 a.m., 3:00 p.m. and 7:00 p.m.; Sunday, September 4, 1:00 p.m. and 5:00 p.m.All seats are reserved. Tickets are available atwww.DisneyOnIce.com or www.ticketmaster.com, at any Ticketmaster outlet, by calling 800-745-3000, or at the Amway Center box office (phone for information only: 407-440-7900). For group ticket sales and information, call 866-248-8740. ORLANDO, FL – July 7, 2016 — Disney On Ice presents Follow Your Heart is bringing Disney•Pixar’s record-breaking animated feature Finding Dory to the ice for the first time in this live production produced by Feld Entertainment. The ice skating extravaganza featuring Disney•Pixar’s Inside Out, Disney’s Frozen and other beloved Disney stories visits Orlandofrom September 2-4, 2016 for six performances at Amway Center. Tickets go on sale today. Just keep swimming with Dory, Nemo, Marlin and new pal Hank from Disney•Pixar’s Finding Dory as they embark on a life-changing excursion to find her parents and discover the true meaning of family. Cheer with the Emotions fromDisney•Pixar’s Inside Out –Joy, Sadness, Anger, Fear and Disgust– as they help Riley find the confidence to win the hockey championship and experience the emotional rollercoaster of growing up. Venture to wintery world of Arendelle where Olaf and Kristoff help reunite royal sisters Anna and Elsa from Disney’s Frozen and learn love is the most powerful magic of all. See Cinderella, Rapunzel, Tiana and the Disney Princesses make their dreams come true through their virtues of bravery, kindness and perseverance. And celebrate true friendship with Buzz Lightyear, Woody and The Toy Story gang. Make unforgettable memories with Mickey, Minnie and all your Disney friends when Disney On Ice presents Follow Your Heart skates into your hometown! Show Times: Friday, September 2, 7:30 p.m.; Saturday, September 3, 11:00 a.m., 3:00 p.m. and 7:00 p.m.; Sunday, September 4, 1:00 p.m. and 5:00 p.m. All seats are reserved. Tickets are available at www.DisneyOnIce.com or www.ticketmaster.com, at any Ticketmaster outlet, by calling 800-745-3000, or at the Amway Center box office (phone for information only: 407-440-7900). For group ticket sales and information, call 866-248-8740. Feld Entertainment is the worldwide leader in producing and presenting live touring family entertainment experiences that lift the human spirit and create indelible memories, with 30 million people in attendance at its shows each year. Feld Entertainment’s productions have appeared in more than 75 countries and on six continents to date and include Ringling Bros. and Barnum & Bailey®, Monster Jam®, Monster Energy Supercross, AMSOIL Arenacross, Disney On Ice, Disney Live! and Marvel Universe LIVE! More information about Feld Entertainment is available online atwww.feldentertainment.com. Welcome to the Americas Cake & Sugarcraft Fair hosted by Satin Ice. The Orange County Convention Center hosted this lavish event and it was a great place for it. The layout was open and welcoming. It was a different type of tradeshow that welcomed all types of people connected to cake. Those of us who love to bake on the weekends with our kids could find some fun cookie cutters and edible glitter to make baking at home exciting. Those who bake wedding cakes for a living and are on the lookout for new ways to ship their wares or find a new stand to put there amazing cakes on, could find them here too. This one event managed to bring the Americas’ love of cake and meld it with some of the most talented cake makers from across the land. On top of Kevin O’Reilly’s incredibly easy to navigate event, there were some of the most talented celebrity cake makers and chefs on hand to share their knowledge and talent with the crowd. The ‘Cake Maker to the Stars’ Mich Turner was on hand to share her passion for structure, refined opulence and detail. Roland Mesnier was there to share some of his incredible memories of his 25+ years of cooking and baking in the White House under 5 different Presidents of the United States. Food Network’s judge on the new series, “Cake Wars,” Ron Ben-Israel was on hand to share how his dance background helps him create incredible cakes with movement and beauty. Friday night brought a completely different fashion show than we have ever been to before. CakeCentral presented the Sugar Arts Fashion Show and Cocktail party. The show included almost all edible fashions walking down the runway. There were incredible gowns, skirts, belly dancer costumes and more. The fashions were made from edible ingredients such as isomalt jewels, wafer paper, gum balls, dark and milk chocolate, gum paste and a new gelatin-based material known as Flexique. It was mind-blowing to see some of the edible items that really truly looked as if it was fabric and moved like typical clothing. The show favorite was by far the incredible Neo-Victorian fashion created by Cake-decorator, Joseph Cumm. It was a masterpiece dipped in a variety of chocolates. Sidney Galpern’s flower-inspired creation was a beautiful, glittery work of art. The amount of time that went into each unique piece was communicated throughout the show. Here’s to having this incredible event come back to Orlando for years to come! Happy Baking! To celebrate the arrival of Disney On Ice celebrates 100 Years of Magic Presented by Stonyfield YoKids Organic Yogurt coming to the Amway Center in Orlando from September 4-6, 2015, Media Mikes would like to give our fans a chance to win a family four pack of tickets to this monumental ice skating spectacular. Please leave us a comment below or send us an email with your favorite Disney character. This giveaway will remain open until August 21st at Noon, Eastern Time. This is open to our readers in US and Canada only. One entry per person, per household. All other entries will be considered invalid. Media Mikes will randomly select winners. Winners will be alerted via email. Save $5 off per ticket with code MOM5. Not valid on VIP or Rink Side seating. Hurry for the best available seats! Code expires September 3, 2015. Feld Entertainment is the worldwide leader in producing and presenting live touring family entertainment experiences that lift the human spirit and create indelible memories, with 30 million people in attendance at its shows each year. Feld Entertainment’s productions have appeared in more than 75 countries and on six continents to date and include Ringling Bros. and Barnum & Bailey®, Monster Jam®, Monster Energy Supercross, Nuclear Cowboyz®, AMSOIL Arenacross, Disney On Ice Presented by Stonyfield YoKids Organic Yogurt, Disney Live! Disney On Ice Presents Princesses & Heroes Comes to Orlando, FL This September! Ice Ice Baby….you know the words, now catch the beat and sing along live when Vanilla Ice headlines in front of the Orlando Eye with special guest Coolio, Saturday March 7 at I-Drive 360’s Tin Roof, a new live music space hosting its first outdoor concert. Doors open at 6:30 p.m. with an Opener (to be announced) from 7:30 – 8 p.m. The concert will have a live performance with Coolio from 8:30 – 9 p.m. and Vanilla Ice takes the stage from 9:30 p.m. until 11 p.m. DETAILS: Ticket Price $20 – click here to purchase tickets. Parking is free. The first hip hop artist to ever top the Billboard charts with his 1990 hit “Ice Ice Baby,” Vanilla Ice was a star of the ’90s. But disputes with his record label over making his image more commercial led him to leave the music business and later host his own home remodeling show, The Vanilla Ice Project, on DIY Network. More recently, Vanilla Ice began recording music again with a less commercial style for a new record label. For additional information go to Vanilla Ice Bio. Rapper Coolio took the 1990s by storm with his hit albums It Takes A Thief, Gangsta’s Paradise and My Soul, with his 1995 single “Gangsta’s Paradise” becoming one of the most successful rap songs of all time and winning a Grammy for Best Rap Solo Performance. He also expanded into television, appearing on numerous reality shows including; Wife Swap, Celebrity Big Brother, and Celebrity Cookoff. A trained chef, Coolio now hosts his own web series, Cookin’ With Coolio and has published a cookbook. For more details click on Coolio Bio. Doors open at 6:30 p.m. with an Opener (to be announced) taking the stage at 7:30 p.m. Coolio is expected to perform at 8:30 p.m. and Vanilla Ice is set to take the stage from 9:30 until 11. Tin Roof’s chefs will be serving up a delicious array of food and drink choices available for purchase in a separate food tent. Tickets are $20 pre-sale and can be purchased online only, starting immediately, at TinRoofOrlando.com. The event is 21 and over. Tin Roof is located at 8371 International Drive, Orlando FL 32819. Parking is free. Feld Entertainment returns“Disney on Ice” to the Amway Center this month with the instant classic and record breaking film “Frozen” taking center stage. “Frozen” came out nearly a year ago and has not cooled down since. People really love this film. Everything about it from its characters to its music. What little girl doesn’t go crazy when “Let it Go” comes on the radio, including my own two year old daughter. Disney and Feld Entertainment really brought the magic again with this new show. It was truly one of the best Disney on Ice shows that I have seen in recent years and will leave every single “Frozen” fan 100% satisfied. The show kicks off with our hosts Mickey Mouse and Minnie Mouse and a few familiar faces such as Disney Princesses Snow White and Rapunzel as well as characters from favorites like Disney∙Pixar’s Toy Story, Finding Nemo and Disney’s The Lion King. The focus of the show is the celebration of love and friendship and it really hits home. What I really loved about this show is the fact that it was decided to focus on “Frozen” entirely. When I have seen past shows of Disney on Ice, they have split the bill between various different set but this one is almost a word for word adaption of “Frozen” but on ice. They changed a few things here and there and re-ordered a few of the songs but it works extremely well and the audience was going absolutely crazy for it. Official Premise: Enter a fantastical winter wonderland beyond all imagination at Disney On Ice presents Frozen! The heartwarming, Academy Award-winning tale you love is now LIVE and skating into your town. You’ll be magically whisked away into the wintery world of Arendelle, where you will be dazzled by amazing special effects and astonishing skating. Sing and dance along to inspiring songs, including “Let It Go.” Join royal sisters Elsa and Anna, the hilarious snowman Olaf, Kristoff, his loyal reindeer Sven and the mystical trolls as they journey to discover that true love is ultimately the most magical power of all! I have been to plenty of rock concerts and it is funny to say but when Anna and Else hit the ice, they were like rock stars. No joke, these girls were screaming like their lives depended on it. It really brought the energy up in the venue. I should also point out that this was only a preview night, the attendance was very exclusive and the audience was less than half capacity. But still, this event reached some very high decibels. Also one of the best feeling as a father is looking over and seeing my two year old daughter going crazy with her favorite songs, dancing and singing along! Disney and Feld Entertainment continue to bring the magic to their audience and if you have chance to see this show, I would highly recommend it. “Frozen” fan or not, it will melt and at the same time warm your heart right up. Marvel Universe LIVE! Age of Heroes Heading to Orlando! KISSIMMEE, Fla. (July 18, 2014) — The magic of the Christmas season comes to Gaylord Palms Resort from November 15, 2014 – January 4, 2015.This year, guests can indulge in holiday merriment like never before. Dreams of the Sugar Plum Fairy and the Mouse King will come to life in a full-on frozen wonderland this winter during Christmas at Gaylord Palms. On Nov. 15 scenes from everyone’s favorite ballet, the Nutcracker, will be reimagined in nearly 2 million pounds of hand-carved vibrant ice sculptures. ICE! will feature four slippery ice slides and live carving stations inside of the Artisans in Action Frostbite Factory. That’s not the only exciting happening during this year’s annual Christmas at Gaylord Palms. Guests can now experience the rush – Alpine Rush Snow Tubing – an 18’ 8-lane giant snow hill created with 1.5 million pounds of real Florida snow. Children and adults of all ages will frolic with delight as they speed down these snow covered hills. holiday displays and more than 2 million twinkling lights. Don’t forget the famous 54-foot-tall majestic Christmas tree; character dining and meet and greets; delectable holiday dining; Cookies with Mrs. Claus and awe-inspiring live entertainment that crowds have grown to love including the rhythmic Luminescence show. With so much to see and do, the best way to experience Christmas at Gaylord Palms is to spend the night with us. Packages are now on sale at ChristmasatGaylordPalms.com. ICE! is open daily from Nov. 15, 2014 to Jan. 4, 2015, including holidays. The Christmas experience begins Nov. 21, 2014. For more information and to purchase tickets, go to www.ChristmasAtGaylordPalms.com. Gaylord Hotels® is a collection of hotels and upscale resorts that afford endless opportunities for leisure travelers and conventioneers. The brand’s hallmark—“everything in one place”—provides guests with diverse dining options, quality spa and fitness center services, top-notch entertainment, on-site shopping and endless activities. Gaylord Hotels is a pioneer in the hotel and convention industry with properties in the nation’s most desirable destinations. Gaylord Hotels include Gaylord Opryland® in Nashville, Tenn.; Gaylord Palms® in Kissimmee, Fla. near Orlando; Gaylord Texan® on Lake Grapevine near Dallas, Texas; Gaylord National® on the Potomac in National Harbor, Md. ; and The Inn at Opryland® in Nashville, Tenn. For more information, please visit http://www.GaylordHotels.com. Marriott International, Inc. (NASDAQ: MAR) is a leading lodging company based in Bethesda, Maryland, USA, with more than 4,000 properties in 78 countries and territories and reported revenues of nearly $13 billion in fiscal year 2013. The company operates and franchises hotels and licenses vacation ownership resorts under 18 brands. For more information or reservations, please visit our web site at www.Marriott.com, and for the latest company news, visit www.MarriottNewsCenter.com.